When it comes to projects around the house, we've got a lot of experience regarding what to do and what not to do. Sometimes you have to learn the hard way, but luckily we've gone through it so that you won't have to! Chances are if you're doing a project and have questions we can get you pointed in the right direction - just stop in and talk with us! You can also check out our "Working With" series quarterly newsletter, featuring in-depth information about various materials and project scopes. You can download the PDF's by clicking on the images below, or sign up for our quarterly newsletter below to receive this feature in your inbox every quarter along with special savings for the featured or related items and products! Believe it or not, there is actually a good bit that goes in to working with flex base, starting with getting good material! 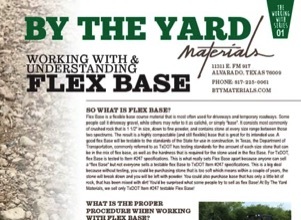 Check out this issue for everything you ever wanted to know about flex base (and probably a little more!). Let us know if you have additional questions! Drainage issues can be a common problem in North Texas with the occasional heavy rains that we can experience. 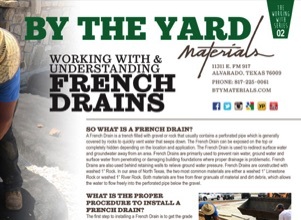 Check out this issue for tips on installing a French Drain, including the best procedure and materials to use! As always, be sure to let us know if you still have questions! Our selection of Metal Art and Pottery is always changing so swing and and stop by to take a look at what we've got! From Spinners to Metal Garden Art to Metal and Wood Wall Art we've got the perfect piece for your backyard, patio, or garden area! Come check it out!